I was sorry to hear of the death of John Gross. His Rise and Fall of the Man of Letters is one of my favourite books. I read it when I was at school and was starting to realise that these novels (English Victorian mostly) that I liked were all part of a tradition of literature and that there were other books that could give you an overview of them so you could plot them on a map. The Rise and Fall was something of a travel book to me, describing a journey around a country of heavy weight magazines and periodicals, of the excitement of articles and ideas, of the discovery of new poets and novelists – a world of writing and discussion – of intellectual life, in short. There was nothing like that where I lived in a prosperous farming town in New Zealand that was just turning itself into a massive suburb, so I was like the kid trying out chords on a guitar reading an imported copy of NME. 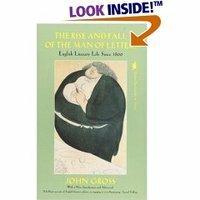 The Rise and Fall of the Man of Letters is a history of British intellectual life since 1800, with potted biographies of literary journalists and neat, throwaway remarks about the periodicals they wrote for and the movements they were involved in. It is very readable, with an open, tolerant humorous tone. I did not yet know the voice of English liberalism, but I found the fair-mindedness congenial.
. . . he was very much a portent. He points forward, not indeed to fascism itself, since after all he never crossed over into the realm of active politics, but to the trahison des clercs, the long procession of artists and intellectuals whose hatred of the modern world has led them to flirt with brutally authoritarian regimes or to clutch at obscurantist dogma. And, as with so many of his successors, the infected areas of his work cannot simply be cordoned off from the healthy. Both are the product of the same fundamentally imperious approach to social complexities, of an imagination naturally drawn to clear-cut diagnoses and drastic solutions, impatient of hedging and compromise. It is so the credit of such a man that he should nevertheless have been willing to prescribe unromantic short-term palliatives (organized emigration, elementary schools, etc.) but this was hardly his first claim on the consideration of his contemporaries, any more than it is on ours. His most enduring distinction as a social critic is to have brought into dramatic focus the ruthlessly disruptive effects of unrestrained laissez-faire industrialism. Trying to describe the larger forces at work in his society, he fell back on metaphors of homesickness, uprooting, disharmony. As metaphors, they are brilliantly suggestive; but as the point of departure for any kind of comprehensive political programme, they need to be handled with care. Like many other romantics, Carlyle ultimately seems to be judging society as though it were an unsuccessful work of art. The analogy is dangerous, since social cohesion can never be as absolute as artistic unity; it will always be easy for those who dream of restoring an organic society to despair, and tempting for them to assume that a deliberately imposed uniformity will come to much the same thing in the end. A romantic is properly concerned with integrity – the integrity of a personality, the integrity of a poem. But politics is the art of rough, very rough approximations; and ever since Plato, the desire and pursuit of the whole has usually turned out, taken far enough and translated into political terms, to be a first-class recipe for totalitarianism.
. . . there is a hostility not merely towards the freelance, but towards the free response. For in spite of its apparent variety, a great deal of critical theory is coercive, designed to enforce approved social and political attitudes (roughly speaking, any attitude that rejects ‘traditional hierarchies’). The belittling of the belle lettrist, the person who writes as he pleases, is a bottom a demand for ideological conformity. The body of theory that has accumulated over the past few years, taken as a whole, seems to me a monstrous excrescence, a vast distraction, a paltry substitute for the experience of literature itself. I believe that in time it will fade, but I am filled with a cold horror at the thought of how much further it could spread before it does. The chief practical purpose of literary histories is to teach us something about books that we have never read and probably never will. I went to school with John Gross at the City of London School, and first met him when we were both 15 years old, and last saw him a few weeks before he died. He was amazingly knowledgeable even at that age and it was rumoured that he did his homework and much background reading on the tube journey from school to home, seven stops. He wrote a marvellous memoir about his early life until the time he went to Oxford University, “A Double Thread”, about growing up Jewish and English. I commend it to you. Can’t imagine what the previous comment is supposed to mean.